WHAT IS THE COLOR OF OPPORTUNITY? by Melvin J. 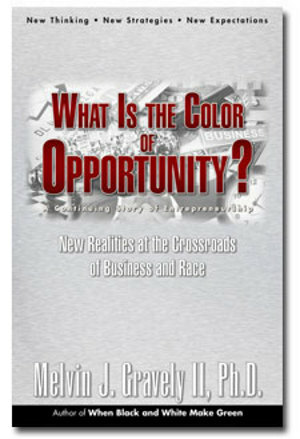 Gravely II, Ph.D.
What Is the Color of Opportunity is an engaging book that guides us around the next corner of minority business development. Based on over three years of research and experience, the book is even more candid, authentic and practical than its predecessors. The very concept of minority business development is at a cross road and the content of this book is surrounded by that reality. It challenges all of us to rethink our role, our strategies and most of all our expectations. What Is the Color of Opportunity, boldly gets to the heart of the real issues and provides practical and proven solutions.